The radiators on the RP saloons are fitted with a bayonet type radiator cap. There are four small pins projecting into the neck of the filler cap which locate into slots in the filler cap. It was one of these pins, which had gone missing, that I was asked to replace. 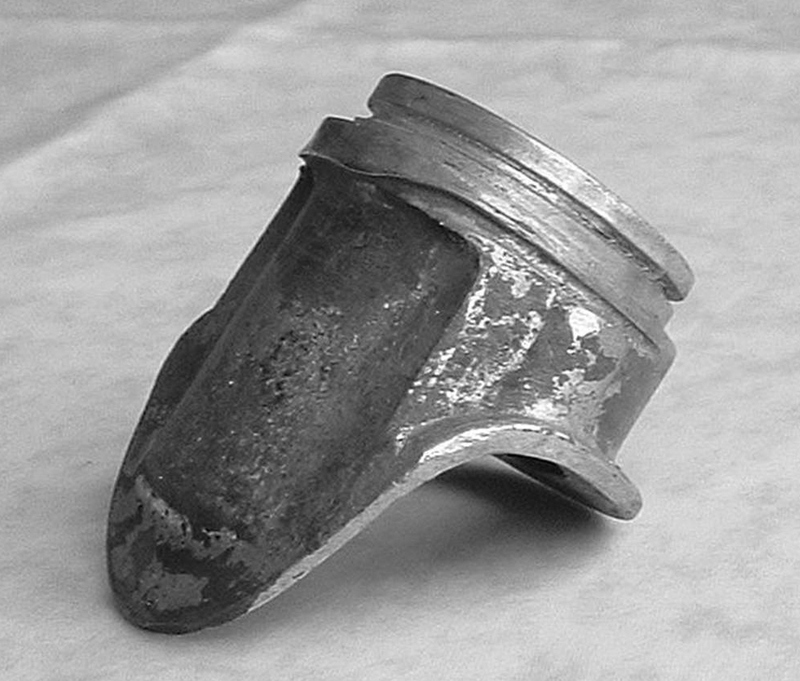 The radiator had been removed from the car so it appeared to be a simple job of turning down a brass pin to size, put it into the hole in the neck of the radiator and rivet over the outer end of the pin to secure it in place. Having made the pin I needed help as two pairs of hands were necessary, one to hold the radiator and one to hold the rivet punch and hammer. However, no matter how I tried I could not get the pin to rivet over enough to hold it in place. 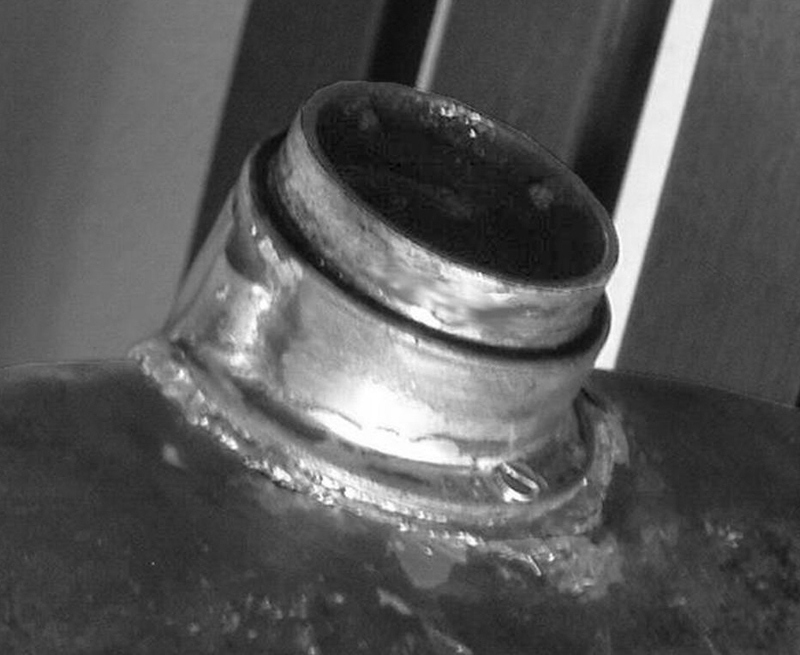 Looking at the neck, I had previously noted the grooves worn in the neck by the radiator cowl, I realised that the neck was splitting along one of the grooves either side of the hole where I was riveting the pin. Disaster !!! Worse when you are working on someone else’s radiator. First, I tried to soft solder all around the neck to both fill the groove and fix the pin and even though I achieved this I was concerned about the strength of the repair. A cautionary note here, if you are soldering a radiator you need to fill the radiator with water so that all the joints nearest to where you are soldering are under water but not too much water so that the heat is dissipated away from the joint you are trying to make. It sometimes pays to walk away from a job which is going less than well and think about it whilst doing other things. So, the following day, having ‘slept on it’ I decided that there were two courses of action. One to replace the neck with one which was not so badly worn the other was to remove the neck, hard solder up the worn and broken parts and then soft solder it back on the radiator. As I had an old radiator with a good neck I removed this and replaced the one on the other radiator, not a simple task but one which was achievable with care, and two small nuts and bolts to keep all in place. Having done the repair I will now set about sorting out the broken neck so that it can be used again in the future. The main reason for this article is to make readers aware of the potential damage that can be done to the radiator if it is not fitted correctly in the cowl. The radiator is fitted by putting the neck through the top hole of the cowl and then resting the bottom of the radiator onto the two feet at the bottom of the cowl and locking it into place by two small plates. Both the top of the radiator and the two places where the radiator rests on the two feet should be well protected by rubber pads. The two bottom ones are easy enough as two rectangular pieces of rubber sheet can be fitted so that the metal feet do not touch any part of the bottom of the radiator. The one that is often forgotten is the top. The best way to achieve this is to use rubber self-amalgamating tape which is available from motor accessory shops, often sold as an emergency radiator hose repair kit. Wrap this around the neck so that a little goes over the shoulder of the neck leaving just the top collar clear of rubber. When you place the radiator into the cowl the rubber should fit snugly into the shaped area around the hole in the cowl so that there is little or no movement. If necessary add additional rubber until it is a snug fit making sure the cowl does not touch the filler neck in any place. An Alternative would be an ‘O’ ring. A properly fitted radiator will hold you in good stead, a poorly fitted radiator will let you down, usually at the most inopportune moment. This article, written by Malcolm Watts, originally appeared in CA7C Seven Focus in Jun 2006 pp6-7.